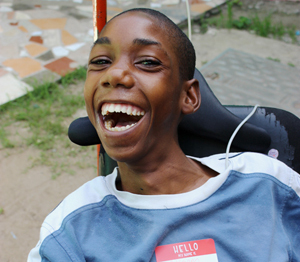 Watch this video of Akeem, a resident of My Father's House with cerebral palsy, use a communications app on a donated iPad to speak for the very first time. The device was donated by a Women of Kentucky mission team volunteer. Hakeem, a staff member, helped record every cell so Akeem could sound like the Jamaican he is. He uses the opportunity to joke around and show his bright and infectious smile.